Nettleship, D.n.. "Razorbill". The Canadian Encyclopedia, 01 August 2018, Historica Canada. 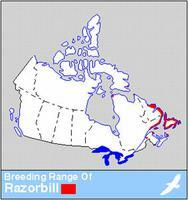 https://www.thecanadianencyclopedia.ca/en/article/razorbill. Accessed 25 April 2019. The razorbill (Alca torda) is a large-sized member of the Auk family. 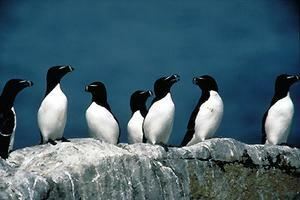 Razorbills on the cliffs of the migratory bird sanctuary on Machias Seal Island, New Brunswick (photo by Gary Black). The razorbill (Alca torda) is a large-sized member of the Auk family. It is about 37-39 cm long and weighs 524-890 grams. 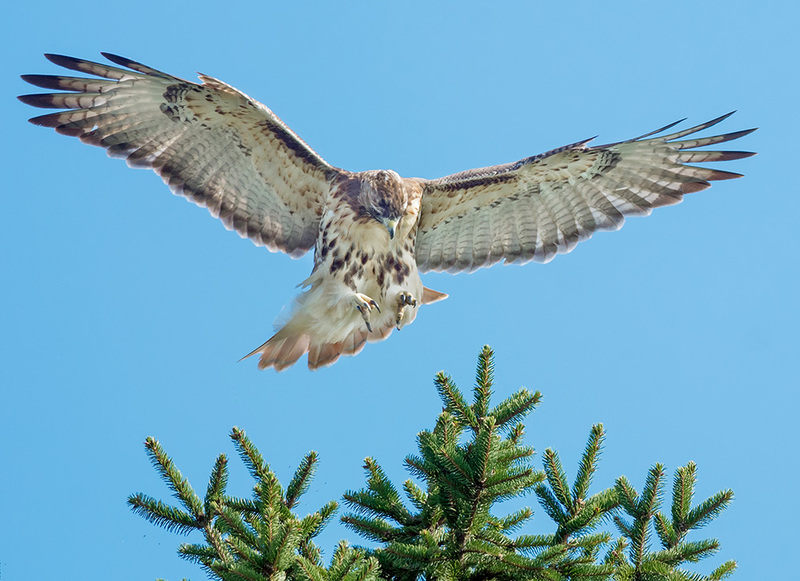 Its head, neck and upperparts are black, with a narrow white line extending from the base of the laterally flattened bill to the eye; underparts are entirely white. Razorbills breed in loose groups on sheltered sites in rock crevices or under rock slabs and boulders. They first breed at 4-5 years. The one egg produced is incubated for 34-39 days. The chick is fed small fish by the parents for about 18 days and then leaves the colony for the sea, accompanied by one parent (the male), which cares for the chick for several weeks. Razorbills winter offshore. 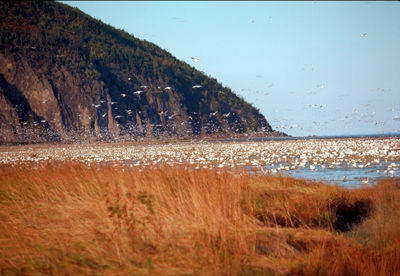 They breed along both coasts of the North Atlantic; in North America, mainly in small colonies throughout Atlantic Canada with most of the population centered in southern Labrador. The northernmost colony in Canada is in Digges Sound at the eastern entrance to Hudson Bay, and there may be small groups off southeastern Baffin Island. The total world breeding population, estimated at about 700 000 pairs, is one of the smallest of the 3 auk species. 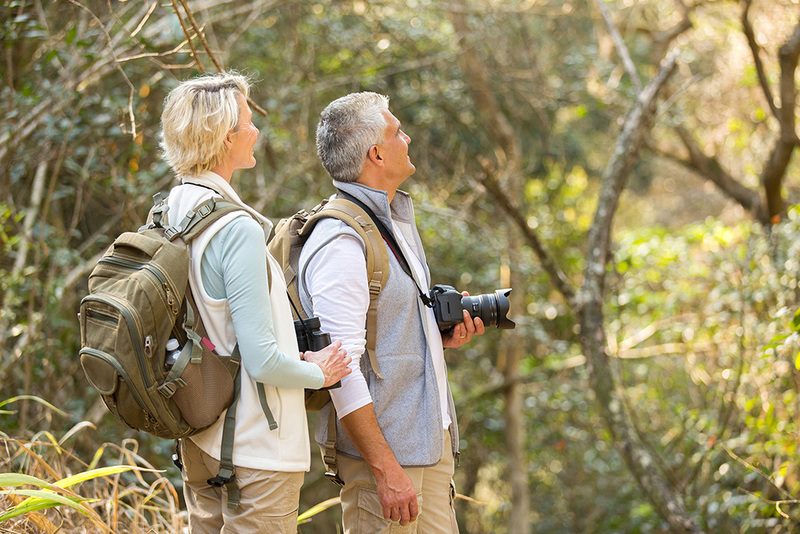 Recently, substantial reduction in numbers has occurred throughout its range, probably because of mortality from oil spills, and in eastern Canada, by illegal hunting as well. D.N. Nettleship, "Family Alcidae (Auks)," Handbook of the Birds of the World, Vol 3: Hoatzin to Auks (1996); Nettleship and T.R. Birkhead, The Atlantic Alcidae: The Evolution, Distribution and Biology of the Auks Inhabiting the Atlantic Ocean and Adjacent Water Areas (1985).